iKON shared about their favorite girl group! 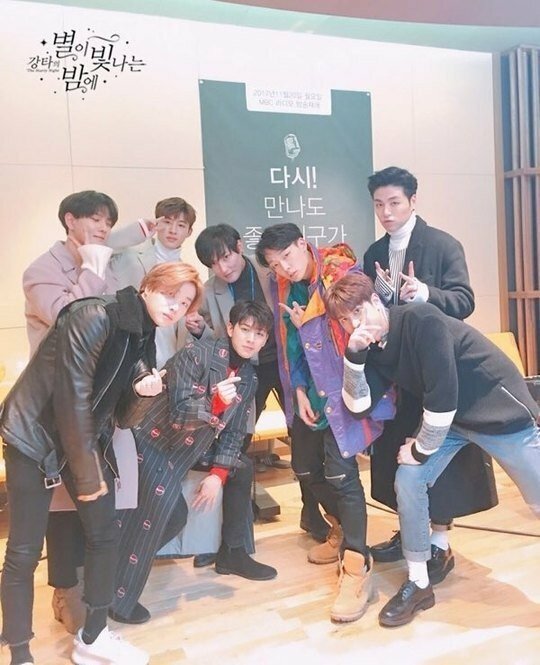 Yumi Kim , Feb. 2, 2018, 2:31 p.m.
iKON appeared on MBC FM’s ‘Kangta’s Starry Night’. After a long time without making any radio appearances, the boys decided it was time to return after their comeback ‘Return’. February 1 marks the return of iKON and they were able to use this time to talk about their comeback preparations and their favorite girl group. DJ Kangta asked the boys a series of questions. For instance, he asked what the leader B.I. nagged at them the most while preparing for their comeback. Kim Jin Hwan answered, "I remember something but it's inappropriate for a broadcast. I remember what he said the time he got really angry" and he added, "I think he just said things like 'Let's do it right!!' the most." DJ Kangta also asked them how many times they have viewed their own MV and Song Yun Hyeon commented, "Honestly, I've seen it 10 times but the whole thing from start to finish a total of 3 times. Donghyuk was in B.I. 's kiss scene and I replayed that part several times because it's funny." The following questions asked about which group they were most interested in and Chanwoo replied, "There is a girl group that we all enjoy and like nowadays. We love Momoland's 'BBoom BBoom'.” The boys also disclosed that Song Yun Hyeong loves Momoland the most.